OH BOY! 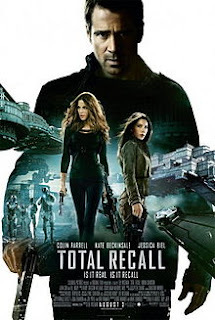 Colin Farrell remade the fondly-remembered Schwartzenegger/Verhoven joint Total Recall! We’re sure their “gritty” version will become the definitive one. Meanwhile, Stu imagines the majesty of a Sharon Stone-Michael Ironsides union, Dan confuses everyone with modern freezer mug technology, and Elliott tells us about his high-rolling Wallace Shawn lifestyle. 0:34 – 42:19 – Hey, Len Wiseman’s never made a bad action film starring his wife Kate Beckensale, right? Right? 57:2- – 1:04:00 – The sad bastards recommend. 1:04:01- 1:05:48 – Goodbyes, theme, and outtakes. Just for informational stuff, the Lift is based on the idea that if you could drill a hole from any one place on the surface of the Earth to any other such place, an object placed at one end of the hole would fall through said hole to the other end where it would reverse direction and return to the original point and reverse again. Neglecting friction, the object would continue to do this forever unless prevented by an outside force. Furthermore it would take 42 minutes for the object to make each trip, no matter where the end points are. There’s a lot of calculus that goes into this, but the basics are the the gravity of the Earth accelerates you as you fall towards the midpoint and then decelerates you an equal amount the rest of the way, bringing you briefly to a complete stop at the opposite side before falling back the other direction. The idea of actually doing this is ludicrous, especially going through the core of the Earth, but if you could build such a tunnel, create a vacuum to avoid air friction, keep the vessel from hitting the sides (again, friction), and were willing to take 42 minutes instead of 17 (for some reason), you could make such a thing and it would require no mechanics inside the tube itself or in the vessel to keep it going. You’d just need something at each end to maintain the vacuum and catch the vessel long enough to load and unload passengers. One of the key points is that they don’t appear to understand the plot of the movie they are making. After their plan has worked perfectly, up to that point, Cranston derides Beckinsale for allowing Farrell to go to Rekall. Except their plan hinges on him doing that. Notice that the message he sees of himself while he’s at the apartment is of him being “captured”. The point is that the “capture” is part of the plan to trojan horse the resistance. It works by everyone one Cranston’s team trying their hardest to look like they want to capture or kill Farrell so that the resistance is convinced that Farrell is on their side when his real personality is on Cranston’s side. If Farrell has been captured at the beginning of movie, how does he set up all the breadcrumbs he uses to find his way back to the resistance except with the help of Cranston’s team. The whole plan hinges on the resistance seeing Farrell stumble onto a version of his old identity, thus getting “chased” by Cranston’s guys, and thinking that he’s actually on their side, bringing him back to Nighy so they can track him. If Beckinsale is in on the plan (which would make sense since she has to know why she’s not supposed to kill him), he should be congratulating her for a job well done. And if she’s really not in on it (which is dangerous), he should be congratulating her for failing in exactly the way he expected her to. So, Bernie is the gritty reboot of Weekend at Bernie’s, right? Wildride – Fascinating stuff on the tunnel through the earth, but your second point makes no sense. Farrell has clearly already gotten Biel’s trust BEFORE the movie started. The convoluted plan gains Cranston nothing and has far too many chances for things to accidentally go wrong and Farrell getting killed before making it to Nighy.